If you have a damaged Hitachi Seiki Spindle that needs repair send it to HST for a fast OEM quality rebuild. You’ll get 30+ years of expert experience guaranteed. We back up all of our Hitachi Seiki repairs with a one year warranty. At HST we like Hitachi Seiki spindles because of their robust design. You’ll notice that most models have a very long front nose. This accommodates the large center spacer used to keep the back to back angular contact bearings as far apart as possible. This helps the spindle better react radial loads induced by milling. The long nose typically seen on most Hitachi Seiki models house the very long center spacers. This allows the spindle to react higher radial loads. With direct drive these spindles provide excellent performance in a moderate price range. Grinding spacers to micron tolerances is critical for proper bearing preload. There are a number of high quality independent spindle repair shops. But before you select one you should have the answers to these questions. Tandem Back to Back bearings separated by a long spacer. When we received this spindle the shaft was very difficult to turn by hand and very rough. As soon as we started our forensic examination the reason became obvious. 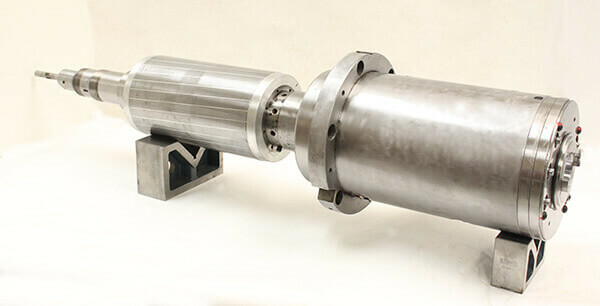 The spindle is air-oil lubricated. 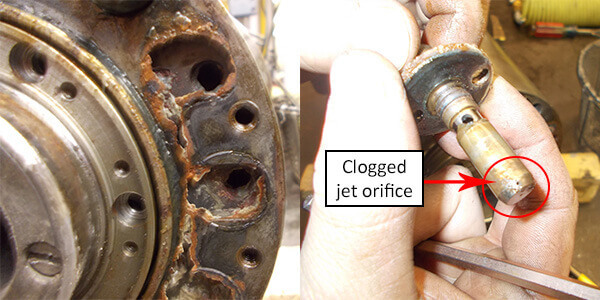 This lubrication method uses jets with small orifices to direct the lubrication mist straight into the rolling elements of each bearing. It is a good system for high speed spindles. However, it requires very clean oil of the proper type. Unfortunately the customer had two strikes against him. First it was the wrong type of oil and second it was contaminated. This partially clogged the jets and what little lubrication that did get through was contaminated. To see our recommendations visit: what lubrication should I use? At HST all oil mist jets are thoroughly cleaned and tested. The bearings are always replaced with top name brand ABEC 7 super precision spindle bearings. 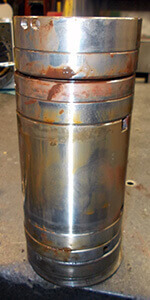 When this spindle repair was complete it performed like new. Vibration readings at 12K RPM was 0.00950 in/sec and Accelerations was 0.10950g. The wrong oil caused degradation and build-up in the lubrication passages. Combined with contamination and the bearings never stood a chance. Even before we started or examination we could see that this spindle was quite the worse for wear. The taper and drive dogs were pretty beat up. When we got it apart we found that things inside were even worse. Both the front and rear journal were worn beyond acceptable limits and the inner spacer had spun on the shaft. All of the journals and other worn surfaces were restored to exact dimensions with our GPG process. Additionally new spacers were manufactured and ground to micron tolerances. Of course as a minimum we always replace the bearings, drawbar springs, all seals and we precision balance all rotating components. When we finished this spindle was as good as new and warrantied for one year. The drive dog and taper are restored to like new condition. Our super precise air gaging guarantees your taper will be ground to the most exact tolerances. The MS series spindles do not have the very long front noses that are found on the HS series. None the less they are still very stout and capable spindles. Before we disassembled this spindle we measured 25µm on the taper. This would translate to well over 100µm on a 300mm test bar. After a comprehensive rebuild and our GPG process on the taper the spindle was back to good as new. The run out at the taper was 2 µm and at 300 mm on our test bar it was 8 µm. Vibration was measured at 0.01310 in/sec and acceleration was 0.10210g. Hitachi Seiki MS400H spindle taper before and after GPG restoration.